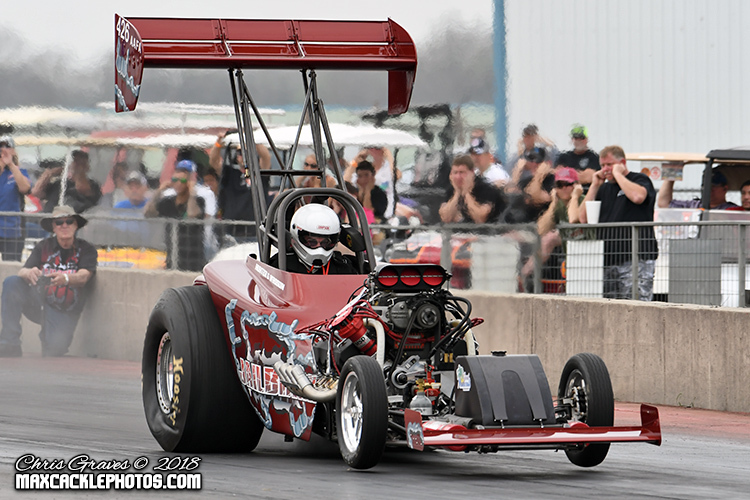 The 2018 season marks twenty two years of Outlaw Fuel Altered racing in the southwest and San Antonio Raceway hosted the season opener as the OFAA headlined the "Nitro Jam" on Saturday, March 17th. With new drivers, several new paint jobs and riding momentum from welcoming back presenting sponsors Good Vibrations Motorsports and Lone Star Forklift, the OFAA racers and fans were eager to kick off the new season. 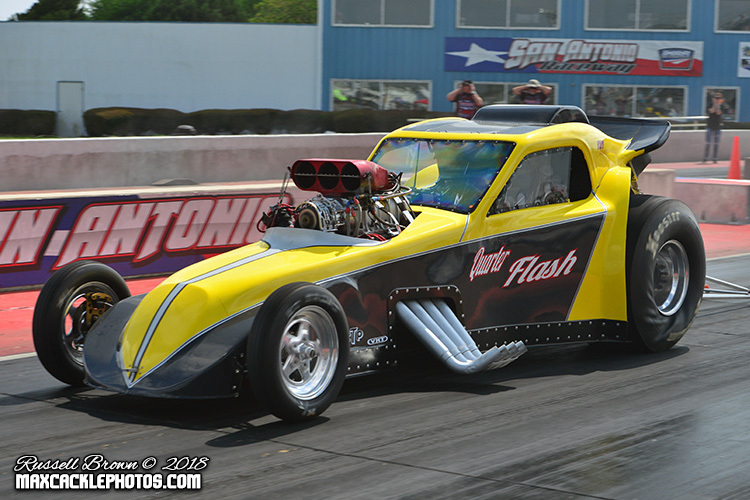 With fifteen cars on the property it was time to fire up the first pair of the new year, which marked the OFAA debut of Rick Grindstaff in the "Quarterflash" blown alcohol entry during the first qualifying session. 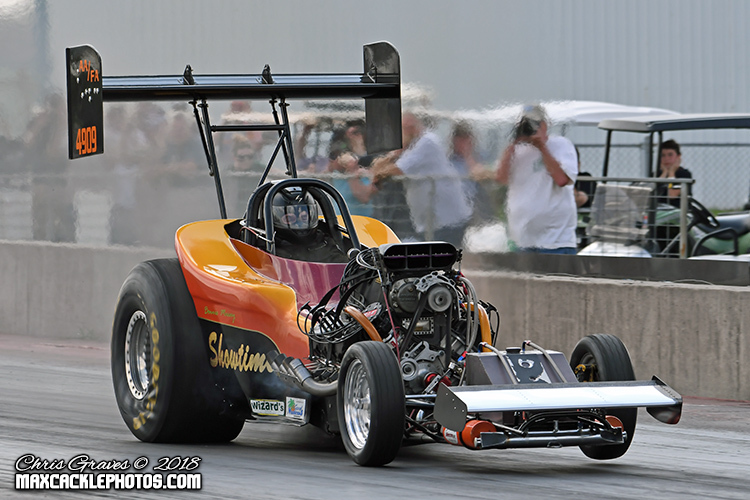 Grindstaff took ownership of the car formerly campaigned by original series member, the late Jerry Williams, who won several races in the late 1990's and early 2000's under the "Wild Thing" name. 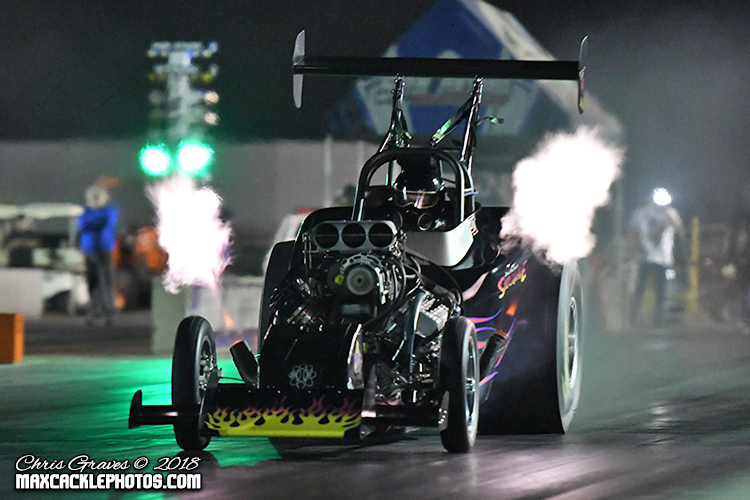 Grindstaff clocked a 4.48 at 142 mph alongside Donny McSwain's "Wild One" entry who posted a 4.57 at 130 mph after shaking the parachute out just past the sixty foot mark. 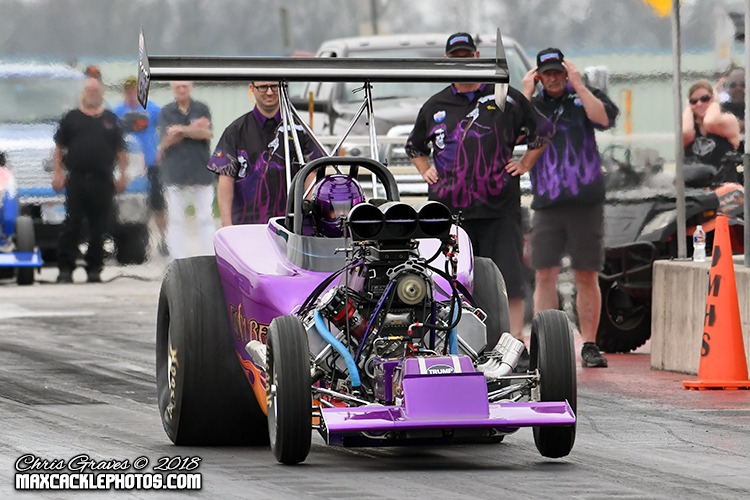 John Broussard debuted a new car and a new look for the "Purple Haze" Louisiana based entry and his 4.01 at 180 mph led the charts after the first session. 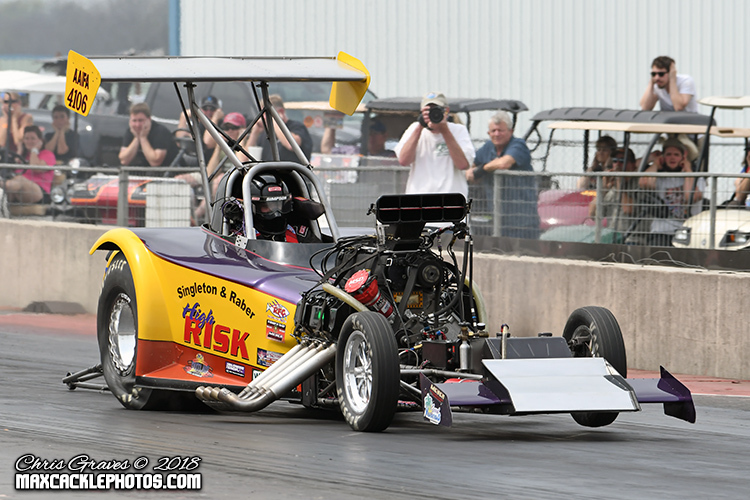 Ken Singleton's "High Risk" clocked a 4.04 at 171 mph off the trailer to secure his spot in the field. In the final pair of the session, Aaron Morrow made his OFAA debut in Terry Darby's "Nitro Relapse" and blasted to a 3.75 at 193 mph. Well hello Mr. Morrow and welcome to the three second club on your first pass in competition! The second session found many teams finding their groove and establishing their tune-ups for eliminations. 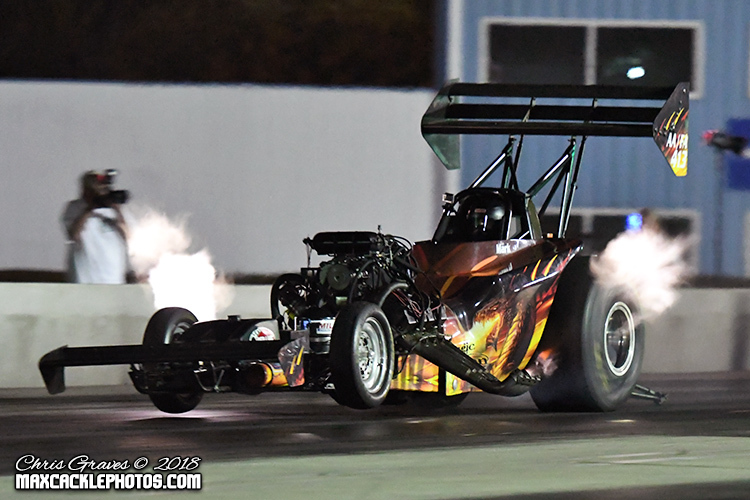 Unfortunately, it also marked the exit for defending series Champion Nick Poloson and team "Sundown" as a mechanical failure forced them to park their nitro burning Fiat for the weekend. Certainly not the way to start a title defense at your hometown race, but this team certainly has proven they can win and will be back in the mix at the next event and seeking redemption. Highlighting the final qualifier was a fiery pass from Donnie Massey as the "Showtime" fuel burner knocked a piston rod through the side of the block and the exiting oil caught fire under the car as Massey came to a hot stop at the big end of the track. The fire was put out and Massey walked away, but did get plenty warm and unfortunately will now be thrashing to build a new motor before heading to Noble, Oklahoma on April 14th for the next show. 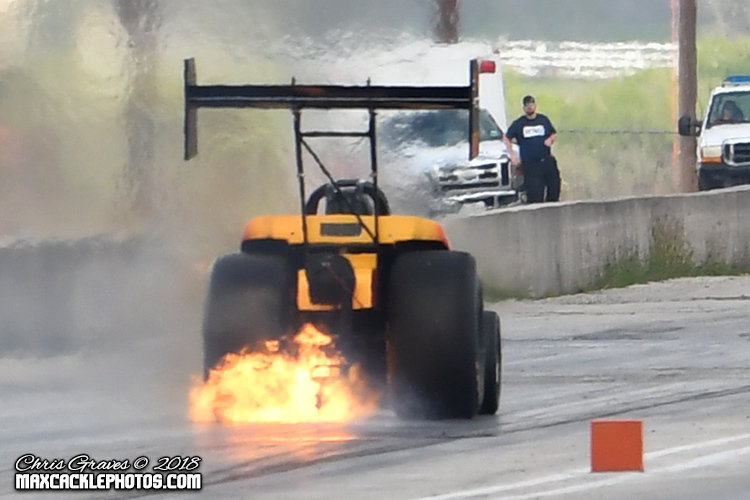 Rick Grindstaff also suffered major engine damage in the second qualifier ending his weekend prematurely. When qualifying was all said and done, John Broussard held on for the top qualifying spot as elimination pairings were set and all eyes were on first round eliminations. Twelve cars were ready to battle it out in first round of eliminations with Mark Billington and Randy Mueller kicking off the action. 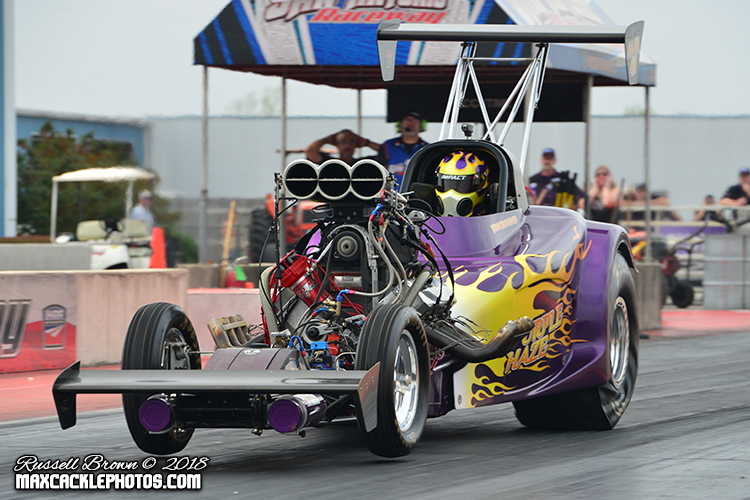 Mueller's 5.27 at 146 mph was no match for Billington who clocked a strong 3.83 at 152 mph to set the pace. John Broussard hoped to ride the momentum from his top qualifying effort and pedaled through tire shake to a 4.06 at 174 mph win against Donny McSwain's 4.19 at 152 with the parachute shaking out of McSwain's entry for a second time. Aaron Morrow fired up next in his first career elimination round and made a big statement with a 3.82 at 185 mph to defeat multi-time Champion Bobby Marriott's 4.00 at 180 mph. 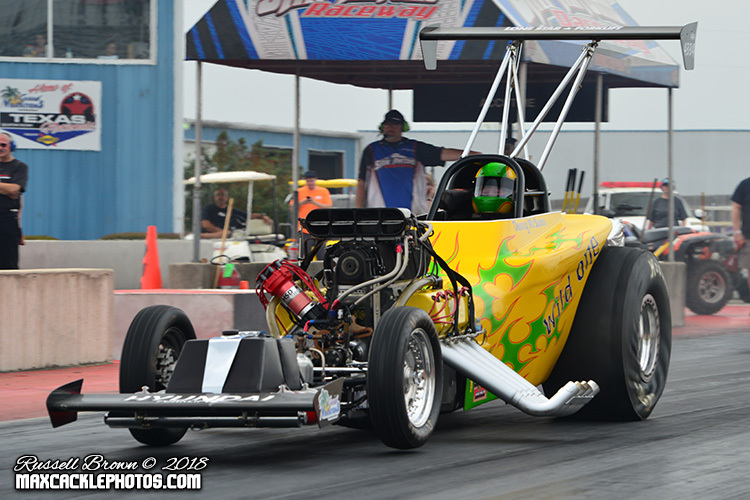 Eliminations continued with Ken Singleton scoring a 3.97 at 189 mph win over Mary Reep's quicker 3.94 at 175 mph. 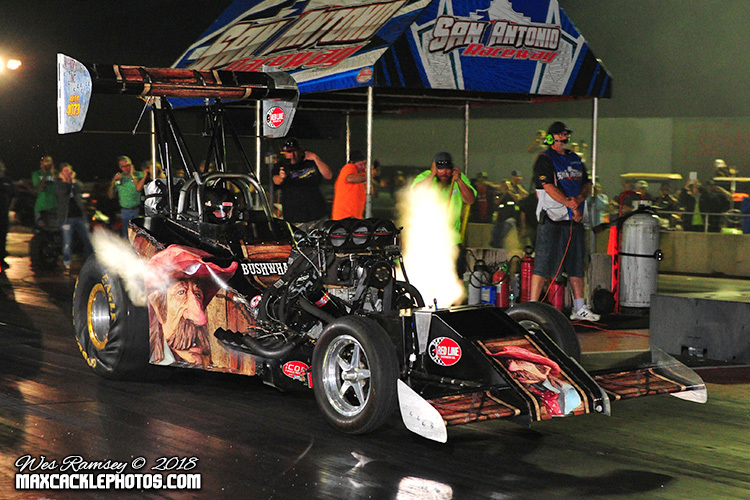 Reep and company also debuted a fantastic brand new paint scheme on the Austin based "Grim Reeper" this weekend. 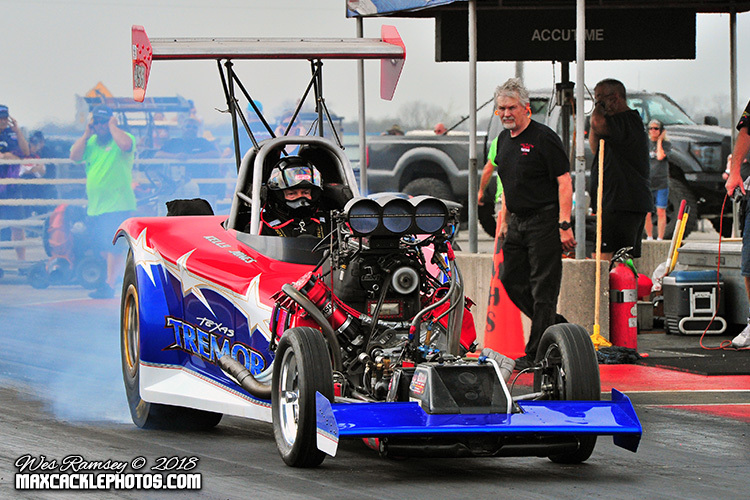 Jimmy Jones' "Texas Tremor" alcohol burner came to the line against Jody Austin's "BushWhacker" with Jones posting a stellar 3.82 at 188 mph to Austin's close 3.88 at 148 mph. With his 3.88, Austin became the 29th member of the OFAA "3 Second Club". In the final pair, Mark Hunter's "Jail Break" fell off pace but still managed a win light over Larry Bradford's struggling 7.58 at 108. 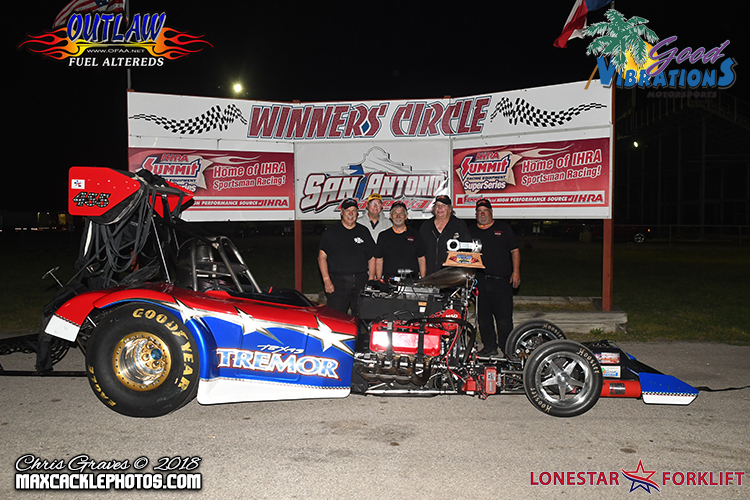 The two quickest winners, Jimmy Jones and first time racer Aaron Morrow were final round bound, while Mark Billington took his 3.83 winning time slip back to the trailer, coming up just short of a ticket to the last dance in a very competitive field in San Antonio. First time finalist Aaron Morrow certainly had a few butterflies in his stomach entering the final round ready to take on multi-time OFAA Champion Jimmy Jones. What a treat the fans witnessed in this final as Jones was off the line first and took the his win of the year with a fine 3.81 at 186 mph to Morrow's very close 3.82 at 186 mph. This, one of the quickest and closest side by side finals in series history. Congratulations to both finalists who kicked off 2018 in fine form. In the winners circle, Jones and crew dedicated their win to the memory of a friend to many in the OFAA series and legendary fuel altered driver, Dale Emery, who passed on Friday night before the event. Racers across the pits were competing with a heavy heart and the entire OFAA series would like to extend it's condolences to the family. Emery was a frequent attendee of Outlaw Fuel Altered events, friend to many in the group and a pioneer of the sport, first driving the famed "Pure Hell" AA/Fuel Altered of Rich Guasco in 1965. The Outlaw Fuel Altereds would like to thank Good Vibrations Motorsports, Lone Star Forklift, Meyer Enterprises, Purple Haze Racing, Grim Reeper Racing, Team Shockwave and Wizard's Warehouse for their support of the series this season. April 14th is the next outing for the series at Thunder Valley Raceway Park in Noble, Oklahoma where Donny McSwain will look to defend his win from last spring. Find out more about the group and when they'll be thundering into a track near you at www.ofaa.net.